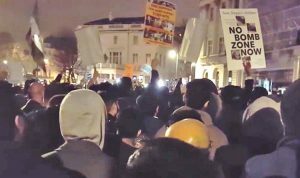 In the street outside the empty embassy in Belgrave Square, London, protesters and Islamic leaders filled the street chanting loudly and calling for American to be punished for Aleppo. The protests started as an alternative to an official demonstration outside Downing Street that called for an end to the bloodshed in Syria. The protest blocked off lanes of traffic when it started at around 9pm on the night of Tuesday, December 13. The protest started with a prayer session outside the Syria embassy that has been vacant since May 22012 when the Syrian ambassador to the UK was expelled by the British government. The protests blocked off the entire road, forcing motorists to find alternate routes to take. During the protest, there were speeches that lasted almost an hour while the crowd chanted Allahu Akbar, which means “God is the greatest,” and cheered for those calling for a global caliphate. Breitbart reported that one protester appeared to be waving a Taliban flag and others were handed placards made by Hizb ut-Tahrir Britain that calls for the reestablishment of a caliphate. It is still unclear who organized the demonstration. The United States has been involved with airstrikes in Syria and provided equipment for rebel groups fighting ISIS.